Modern customers take for granted an opportunity of doing different operations through their smartphones. That's the reason why so many brands which would seem to be far from IT (e.g. Coca-Cola), adopt mobile solutions for their businesses. They solve a variety of problems with their help and increase the brand awareness. Hotel mobile apps can do these and much more if you'll use them the right way. In this post, we'll consider why branded hotel application is better than third-party solutions like TripAdvisor and show you for which purposes other hotels already use mobile apps. 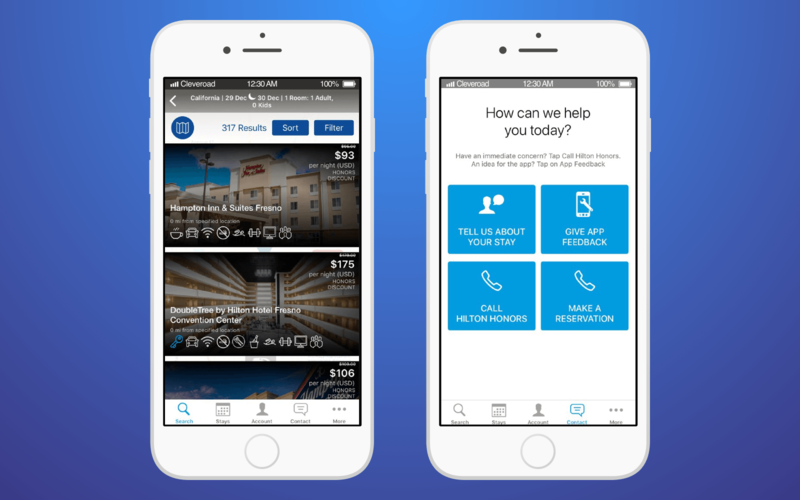 Innovation in hotel industry: Why do you need a hotel app? We won't take your time arguing that a website is no longer enough in 2018. If you're reading this article -- you probably already know that. We better take a look at some real reasons behind the creation of the hotel app. There is the entire generation of technology lovers and just tech-savvy guests who want to experience hotel innovation and get an instant access to some options or services. Hotel application is the best and fastest way to satisfy these needs. For example, through the mobile app of Marriott hotel chain, guests are able to ask for extra towels, transfer to airport, and even wake-up calls. 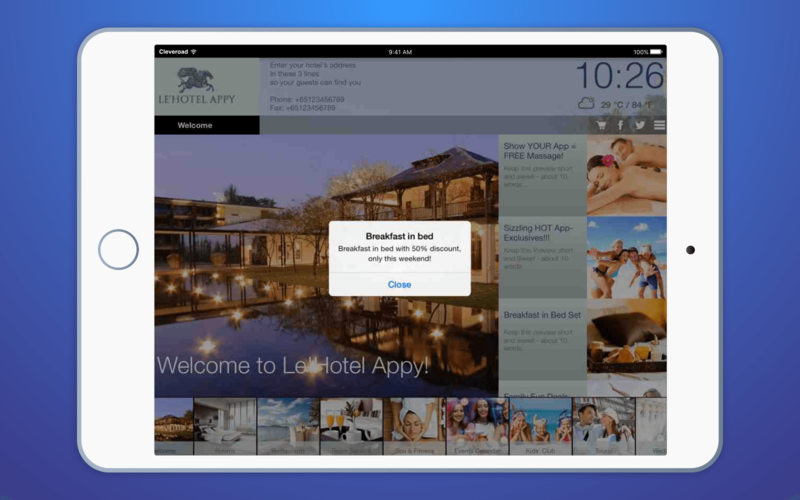 Another example is Hyatt Hotel's app that allows customers to check in and out on the go. A variety of hotels over the world introduce such features as remote TV control through its hotel mobile app. You can go further and allow guests to control light, lock, curtains, and other appliances. It's called the Internet of Things. To be more useful for guests, hotel apps can contain some location-specific features. It's a good idea to add local weather or a guide to popular local activities, interesting places, and restaurants. Also, you can allow customers contacting the concierge through the app to ask questions. Ritz-Carlton hotels already use such an approach. 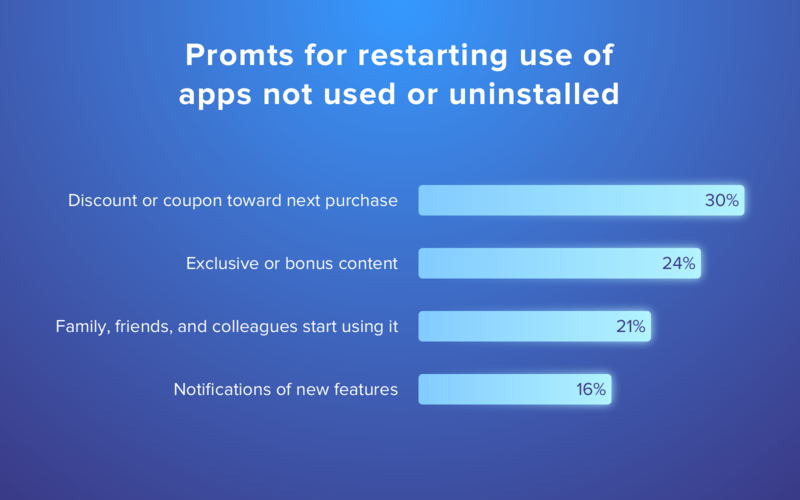 Mobile apps have just great tooling for motivating guests on various additional purchases. Hotel tech allows using push notifications along with in-app messaging in order to inform your guests about today's hot deals or ask whether they want to have a dinner in hotel's restaurant tonight. Hotels and technology combined together allow management keep track of peak demand for specific services and, respectively, manage and coordinate staff effectively. Without an app or any hotel management software, the processing of requests can take a while. As a result, some of guests may wait the ordered service for too long or not get it at all. In turn, it leads to financial loses that hotels could cover from selling additional services. Customers tend to trust companies with mobile apps more than others. Especially to the ones which adopt new technology in hotel industry. Moreover, having your own app you can implement a loyalty program for your hotel's guests. Besides, through the hotel application, you can encourage guests to leave feedback about their stay rewarding them with the scores that can furtherly be exchanged on real hotel services. Respectively, all these have a positive effect on the hotel and increase brand awareness. Hotel management is challenging and connected with a plethora of difficulties. To succeed in this business, you have to work on numerous issues and channels. Let's consider the most widespread problems hoteliers are faced with and think of their solution through the branded hotel application. What to say, the competition in the hospitality industry has always been high. Things become even more complicated as the market grows. 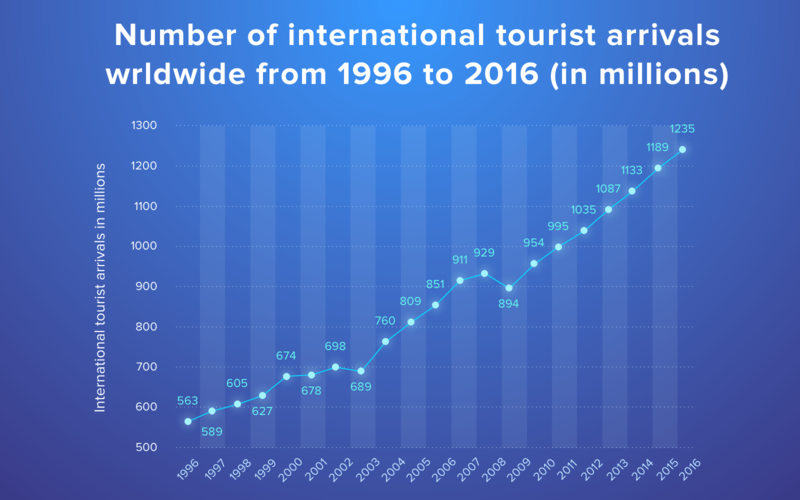 In 2016, the number of international tourists exceeded 1 billion people, not talking about trips within a certain country. As you see, the market grows incredibly fast that means accommodation is in demand. But you cannot deny the fact there are hundreds of thousands of other hotels except for yours. In addition, there are cheaper or free options like hostels, couchsurfing, and digital solutions like Airbnb. So, it takes really enormous efforts to stand out from the crowd and convince customers they should choose exactly your hotel from all the other options available. It's especially hard if your hotel's brand isn't so recognizable yet. By adopting hotel technology trends like own branded mobile app -- you increase your chances to be chosen. Hotel app development can solve the issue with brand awareness, draw the attention of potential customers and engage them. Everything you need is to explore solutions from competitors (we'll talk about it a little further) and understand what may hook your target audience (specific features, special offers). Demand for accommodation grows proportionally to the customer's expectations concerning the level of services. For one or another reason, it doesn't always match with what hotels are really able to offer its clients. Technology used in hotel business can solve that. The first thing you should do if you notice any signs of poor satisfaction is to interview your guests. It'll help you to learn whether there are any problem areas and start working on their improvement through hotel technology solution. Hotel mobile apps also contribute to higher customer satisfaction. According to the J.D. Power research, hoteliers that concentrate on new technology in hotels as a key part of good service -- get better customer satisfaction ratings. 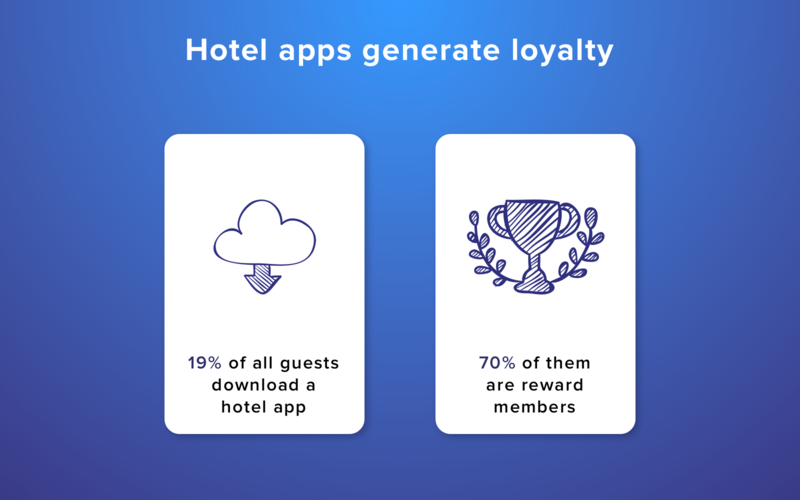 Also, this research found out that hotel mobile apps bring more loyalty to the brand. This way, 19% of all guests download a hotel app, but 70% of people who installed it are reward members. Unfortunately, statistics show that about 70% of hotels all around the globe use old-fashioned marketing methods and most of them ignore digital marketing including the use of information technology in hotel industry. That's a terrible mistake for any business in 2018. If your hotel isn't one of them and you adopt the latest digital marketing trends -- hotel mobile app can be a powerful addition to your strategy. For instance, you can launch a loyalty program working through your app. But according to J.D. Power, only 38% of customers will use your app during their stay, not to mention its use as they check out. To remind customers of your hotel's existence, you may use some of the tricks underneath. For instance, some branded hotel apps contain articles on different relevant topics apart from their main functionality. Isn't that sound like one of hotel innovation ideas? In hotel business, your personnel meets people of different nationalities, cultural realities, and countries. It's physically impossible to please everyone because each person has own preferences. The standard situation looks something like that: a guest comes to reception, grabs his or her keys, comes into a suit, lives there for some time and then moves away. With this approach, your customer may never reminisce your hotel. But things change dramatically if to add a pinch of personalization. Latest technology in hotel industry allows you to learn some habits and preferences of customers even before they crossed your hotel's threshold. For instance, you may collect information about them via your website or think through other methods. Everything you need are dedicated web developers. In case, it's hard and expensive to implement, you may place the most popular customization options for suits in your hotel mobile app. For example, allow customers to choose the beverage in minibar through the app even before they moved in or order additional pillows, towels etc. As we promised, it's time to analyze the diversity of branded hotel apps in order to see what features are already in use among other brands and understand the importance of technology in hotel industry. With the help of this hotel mobile app, users can book their stay, as well as call to the hotel. 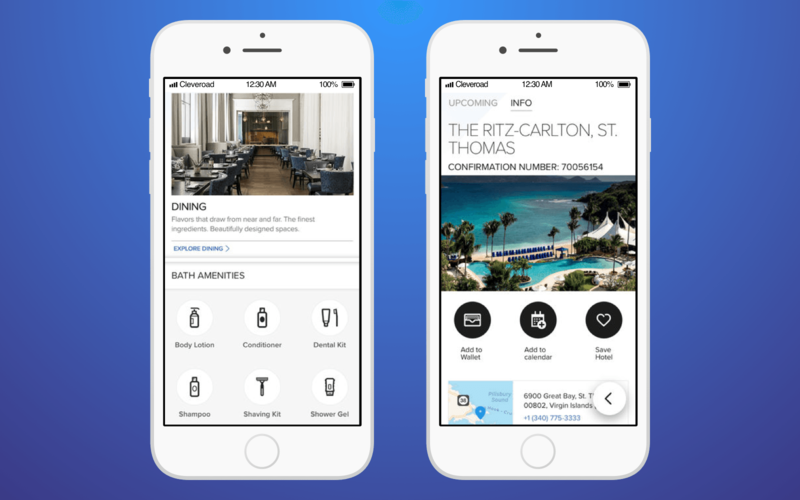 Apart from these pretty common features, Hilton app has a reward program with the help of which customers can earn miles, as well as points that can be used for stays. That's possible due to the company's partnership with over 50 airlines. Besides, those miles can be transferred to friends or family members. However, the most interesting thing about this application lies in its future update. In the beginning of 2018, Hilton will provide its hotel mobile app with an opportunity to control lighting, temperature, door lock etc. This hotel application has a pretty unusual approach. Instead of standard features like booking, it offers playlists with music for different occasions. In this app, users are able to overview and look for the hotels but to book their stay they have to download another app of the company called SPG. 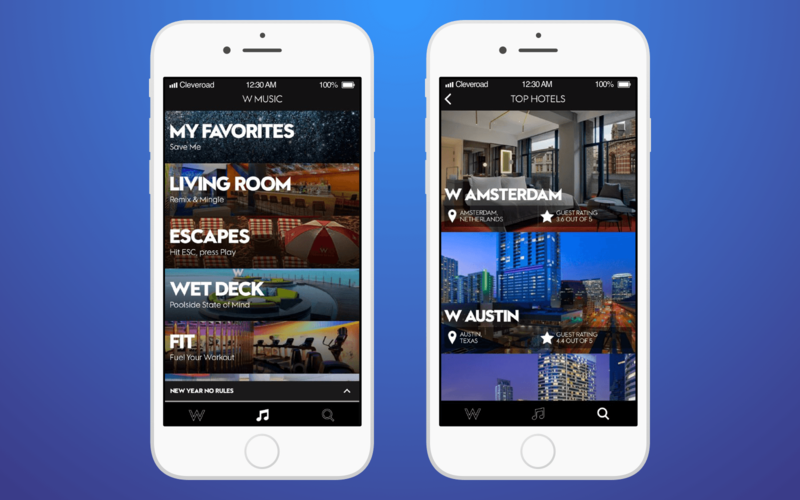 It's worth noting that W Hotels Worldwide app has fresh and stylish UI/UX design. This hotel mobile app allows guests to book their stay, as well as provide them with convenient check-in and check-out via Mobile Check-In area at the reception. Except for these, guests can order some additional items for their rooms such as towels or extra toiletries. Besides, through this hotel application guests can order in-room dining. Another interesting feature is the calendar of events along with tips on what to visit in this area. As you see, there are lots of areas that information technology in hotel industry can influence on. They are capable of making your guest's stay unforgettable, as well as bring you some additional profit and awareness of the hotel. In case you think of building an app for your hotel, we'll gladly discuss all the details with you. Contact our managers to get answers to your questions! Also, subscribe to our newsletter in order to be aware of our latest posts and YouTube videos. Thank you. Your voice will be taken into consideration soon! Check inbox to get useful clients guide.